1991. Watercolor, ink, color pencil. 6½" x 8"
In 1991 George H W Bush sent US troops to Saudi Arabia to take part in “Operation Desert Shield.” They were sent there in response to Iraq's occupation of Kuwait to prevent Saddam Hussein from invading Saudi Arabia, and ultimately (as we discovered later) to drive Iraq out of Kuwait in “Operation Desert Storm.” But before any fighting took place, American troops in Saudi Arabia spent a lot of time sitting around waiting for action. Meanwhile just about every media outlet in the U.S. and Europe sent reporters to the Gulf, each looking for a story. It got a bit ridiculous; it seemed at times like there were more media members than soldiers, and they were all desperate to find something to talk about, despite the fact there was almost nothing to talk about. 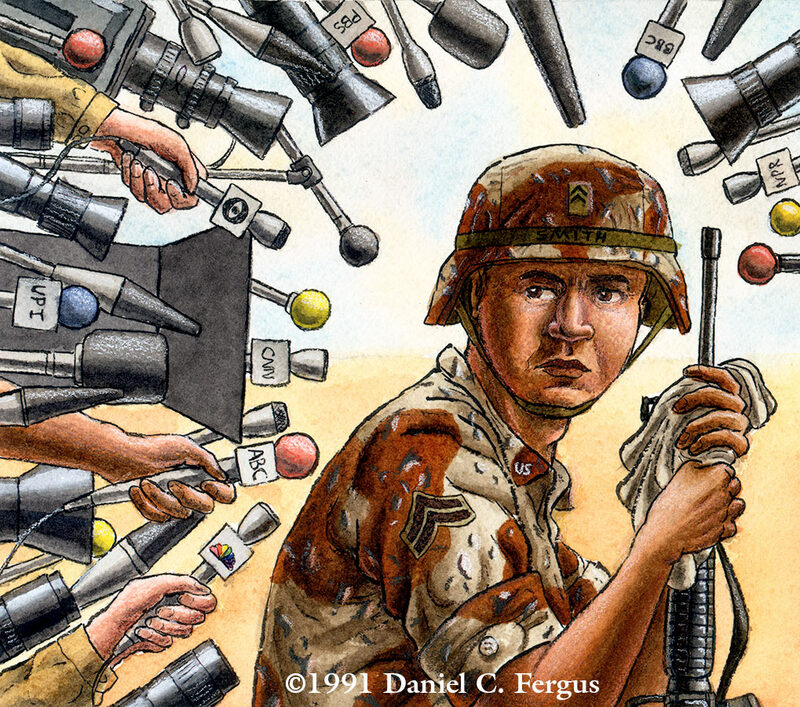 Of course, things changed once the bullets started to fly; however this piece was done in the midst of the Desert Shield days, as a comment on the media's activities, and not meant to be viewed as a comment on the conflict itself.